With President Pranab Mukherjee clearing the decks for appointment of Justice G Rohini, to head as the Chief Justice of Delhi High Court, the High Court in the capital will soon get its first woman Chief Justice. Justice G Rohini, aged 58, who is the most senior judge of the Andhra Pradesh High Court, will be the 10th woman Judge in the Delhi High Court, which has nine women Judges out of a strength of 40 and is expected to stay for a period of four years. Live Law reported that Justice G Rohini of Andhra Pradesh High Court was elevated as the Chief Justice of Delhi High Court. She succeeded Justice NV Ramana who was elevated to the Supreme Court from the position of Chief Justice of Delhi High Court. From company and constitutional matters to criminal cases, Justice Rohini has presided over an array of cases. In 2012, she was part of a two-judge bench that dismissed a writ petition filed by Y.S. Vijayamma, wife of former Andhra Pradesh chief minister Y.S. Rajasekhara Reddy, to order an inquiry into the assets of Rajasekhara Reddy and Telugu Desam Party chief Chandrababu Naidu. Justice Rohini a science graduate from Osmania University was born on 14th April 1955 at Visakhapatnam in Andhra Pradesh. Later, she obtained a law degree with first class from College of Law, Andhra University. Her career as a lawyer, which is more than two-decade long, began in 1980, and during her long career she was associated with several public issues as well as labor and service matters. Besides being a practicing lawyer in the Andhra Pradesh High Court and in administrative tribunals and civil courts, she also tried her hands at legal journalism,as she was a reporter of Andhra Pradesh law journals. In 1985, she became the executive editor of the journals. Justice Rohini has also been a government pleader in the Andhra Pradesh High Court wherein she was in charge of departments including environment, consumer affairs, labor, employment and training. On June 25, 2001 she was elevated from this post to the bench and was appointed an Additional Judge. She has also served on the High Court Juvenile Justice Committee. In 2002, she was sworn in as a High Court Judge. She was the chairperson of the Andhra Pradesh Judicial Academy and also headed the Andhra Pradesh State Legal Services Authority. Justice G Rohini has taken up issues of protection of the girl child, working women and better relationship between the Bar and Bench during her tenure, and also released the Handbook on Women and Human Rights at the annual day meeting of the Indian Women Network (IWN), an initiative of the Confederation of Indian Industry (CII). She was also a part of the Bench of the Andhra Pradesh High Court, which had permitted the AP government to appoint special officers to district panchayati raj institutions, and to fix reservations in the panchayati raj institutions for backward classes.In 2010-11, during the height of the Telangana protest a state civil services aspirant from Medak district petitioned Justice Rohini indicating the logistical difficulties in reaching his examination center and requesting her interference as state-owned buses remained off the roads. She, in turn, dismissed the case asking how the Petitioner succeeded to come to the state capital for the hearing. Justice Rohini’s elevation as Delhi’s first woman Chief Justice comes at a time when safety for women and law and order issues continue to be a matter of concern.Delhi High Court Bar Association, which welcomed her appointment, has said the move will act as an encouragement for women to consider law as a career and also give a boost to women lawyers. Out of the 29 Judges in the Supreme Court, only two are women – Justice Gyan Sudha Misra and Justice Ranjana Prakash Desai. All the High Courts across India have almost 650 Judges and only 52 of them are women.The first woman Chief Justice of a High Court, Justice Leila Seth, who served as the Chief Justice of the Himachal Pradesh High Court, was from the Delhi High Court. Justice Rohini is the third woman Chief Justice in the High Courts of India. 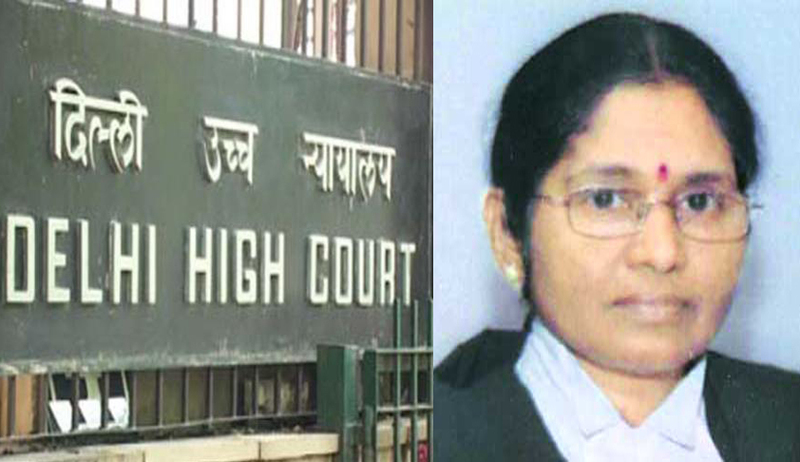 In November, Justice R. Banumathi was appointed Chief Justice of the Jharkhand High Court, and on 3 March, the North Goa Principal and District and Session Judge Anuja Prabhu dessai was appointed Chief Justice of the Bombay High Court.